Since Kerry Greyhound Connection is based, not surprisingly, down in County Kerry, and I’m 3.5 hours away in County Mayo, the best way I could help out was to continue designing marketing and promotional materials for them, such as posters, pull-up banners and other printed pieces. In 2011 they decided to change the name of the organization, as they needed a more national appeal, and using ‘Kerry’ in the title was limiting them to a regional area. Plus if your county happens to be a rival in football or GAA, forget about trying to fundraise! After much discussion and brainstorming, the board came up with a new name that does what it says on the tin: Homes for Unwanted Greyhounds or HUG, for short. This is a more self-explanatory name that also conjures up positive associations, as they need to help the public to believe that greyhounds are in fact quite huggable! The next step was asking if I could design a new logo to go along with the new name. 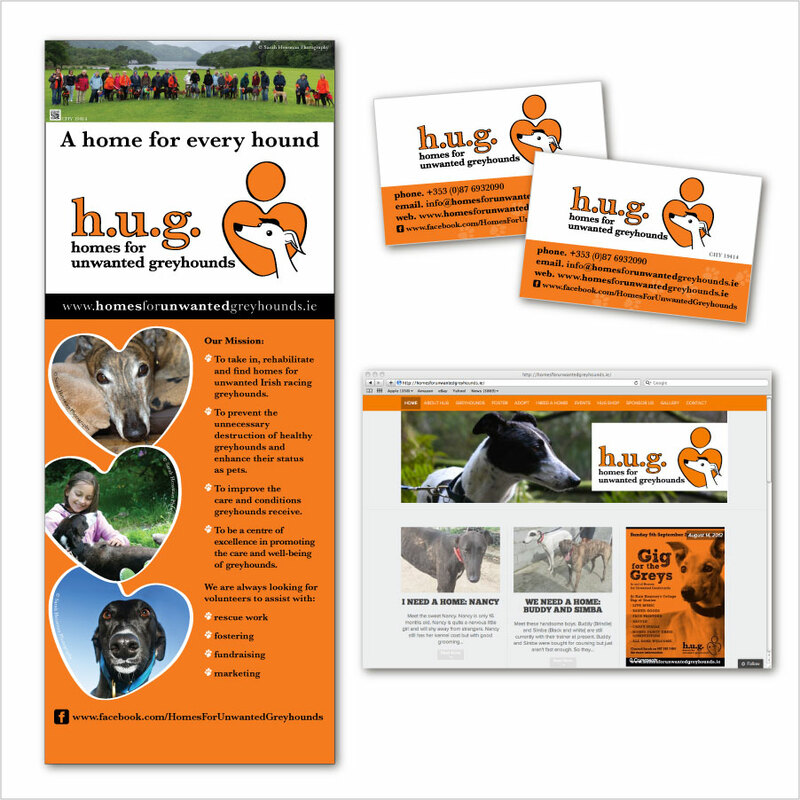 We started with whole range of concepts, trying to bring together the elements of human and greyhound interaction, even to imitate an actual hug, and many variations on the typographic treatment of the acronym HUG along with the full name. The board had also discussed colour choices extensively, researching the emotive reactions of various colours, deciding that orange would be a good colour for the new brand. Orange stands out from the crowd, and is often used on safety or rescue signage due to the bright hue, but doesn’t signify more acute ideas such as ‘danger’ that we might associate with red. Knowing that we would most likely end up with bright orange promotional shirts to wear at events didn’t deter the group, even if it meant looking a bit like the HUG pumpkins! After several rounds of revisions, and the combination of some earlier concepts, we finally reached a final solution with “Hugzy” our stylized logo character, and serif typography that includes subtle elements such as the heart shape repeated in the counterform of the ‘g’ character and even the highlights in Hugzy’s eyes use the same shape to tie it all together. The next step was to apply the new identity to a range of marketing materials, as we made the switch over from the KGC brand to the new HUG logo and colour palette, which included business cards, pull-up banners, leaflets and the website. We also started a facebook page which has been phenomenally successful, reaching over 900 ‘likes’ in just five months! We also introduced new HUG merchandise to sell as fundraisers, including funky orange dog bandanas and rubber wristbands (for people).